Apo-Amoxi (Amoxycillin) (also called amoxicillin) treats bacterial infections. It works by attacking the bacteria and preventing bacterial cell walls from being properly formed. Apo-Amoxi (Amoxycillin) (also called amoxicillin) treats bacterial infections. It works by attacking the bacteria and preventing bacterial cell walls from being properly formed. This results in damaged cell walls, and because of this, the bacteria are unable to survive. Medical experts refer to this as bactericidal action. Uses for this medication include the treatment of infections occurring in the upper and lower respiratory tract, nasal passages, sinuses, ear, urinary tract, skin and abdomen. It has also been used for gonorrhoea, Lyme disease, peptic ulcers associated with a type of bacterial called helicobacter pylori, and to prevent bacterial endocarditis. Other conditions may also be treated with it. 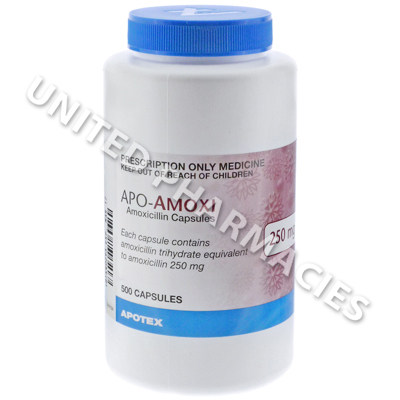 Apo-Amoxi (Amoxycillin) capsules each contain 250mg of the main active ingredient. After consulting your doctor, full instructions in relation to the daily dosage and frequency of administration will be provided. Some adult patients treating upper respiratory tract infections, urinary tract infections or soft tissue and skin infections may be told to take a 250mg capsule every 8 hours. Severe symptoms or lower respiratory tract infections may need to be treated with a higher dosage. Follow the instructions given by your doctor. In addition to those listed above, other reactions could also affect patients. Medical attention will be required immediately if you suffer from diarrhoea containing blood, bruises, red or purple spots appearing underneath the skin, low levels of energy, severe tiredness or any additional serious reactions that have not been listed in this paragraph. Your doctor may recommend taking the medicine during meals so as to help reduce the occurrence of some side effects, especially those affecting the gastrointestinal system. Unless otherwise directed by your doctor, it is very important that you keep taking the antibiotic for the entire duration that your doctor prescribes. Always use Apo-Amoxi (Amoxycillin) as you have been prescribed by your doctor. Never self-medicate or change your dosage without first consulting your doctor. The correct dosage can vary depending on your health, medical history, and the severity of the condition being treated.